2014 has been another great year for Australopers. We continued to be the dominant orienteering club in Tasmania, and for that matter one of the leading clubs in Australia. We organised the vast majority of events held in the state during the year and reaped the benefits of increased income from our share of event fees and new members from those participating. My thanks to the Executive, Committee members and all those members who volunteered to put on great events throughout the year. Introducing into service our new equipment and event registration trailer. Increasing membership to 160 from 151. 32 of our members competing at Rylestone NSW in the Easter 3 Days competition and 36 in Western Australia for the Aus Champs carnival. Our senior elite competitor Grace Crane being awarded the “Athlete of The Year” trophy. Continuing to run the very successful Schools / Corporate Challenge series of 8 events in Autumn and 8 events in Spring as well as the winter Saturday series. Arranging for Danish orienteer Henrik Rindom Knudsen to be our first “Coach in Residence”. GENERAL: Australopers continues to be the largest Orienteering club in Tasmania and remains one of the dominant clubs in Australia. As at 31 Dec 2014 we had 160 members on the books, compared to 55 for EVOC and 46 for WROC. Australopers’ strength lies not only in the competitive side but in its broad base. We have a good volunteer base and a strong commitment to event organisation. 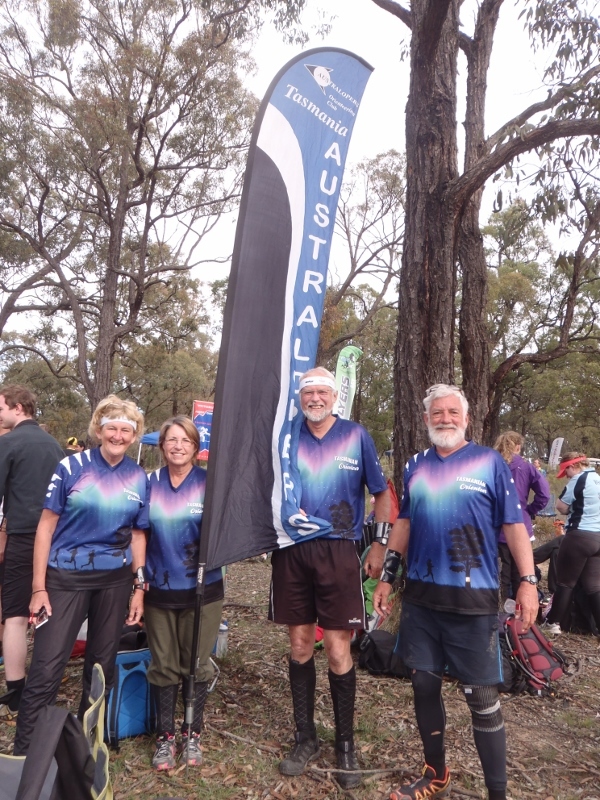 Australopers also continues to place a strong emphasis on family involvement and the social side of orienteering. In general terms Australopers has a great bunch of people as members! Sally Wayte who has worked tirelessly as Secretary throughout the year. Julian Roscoe who stepped into the vacant Treasurer portfolio and has worked tirelessly to balance the books. Rosie Rutledge for her great contributions to each edition of O Know. Martin Bicevskis who with Elizabeth has put in untold hours organising Sportident and Autodownload timing systems at Australopers events. Jan Hardy as our chief representative and Chair of the OT selection panel and as Membership Officer. Mike Calder who has organised our event volunteer roster and done a huge amount of schools development work. Ross Kelly for his work on behalf of the club putting our feedback into the development of the annual calendar of events. Wendy Andrewartha for letting us continue to use her garage as our equipment store. Wayne Griggs for his coaching efforts. Jane Calder as social secretary. And all those members who helped with event organisation including course planning, control placing, registration, control collection and so on. Costs associated with our coach in residence, Henrik Rindom Knudsen. MEMBERSHIP: Membership at 31 December was 160, up from 151 last year, 145 at the end of 2012 and 127 in 2011. To date many members have renewed membership but some have not. We will be contacting all unfinancial members in coming weeks to remind them to renew their membership. EVENTS: Our Autumn and Spring twilight series events continued to bring in large numbers of competitors as did the popular winter series. We also organised a number of statewide events including assisting Pathfinders run the Sprint Championships in Devonport. In addition some special events were held and our thanks go to Martin Bicevskis who has tried a number of new initiatives including orienteering in the Botanical gardens and holding a “maze O” in association with twilight events. During the latter half of the year many members were involved in the buildup to the World Cup and Oceania Championships and the Hobart Shorts held in early 2015. Key members involved were Wendy Andrewartha (parking), Martin Bicevskis (public address), Mike and Jane Calder (toilets), Gayle West (catering), Jon McComb (download), Kim Carroll (childrens area), Jeff Dunn (presentations, Bert Elson (logistics and Hobart Shorts) and Julian Roscoe (Master of Ceremonies). In addition, dozens of club members helped out on the various teams associated with the carnival. COACHING: Coaching events were again held for both experienced and beginner members. In early October Danish Orienteer Henrik Rindom Knudsen arrived as our first Coach in Residence. Henrik assisted in schools development as well as holding a range of training exercises open to all orienteers. In January 2015 our second Coach in Residence Richard Parkin arrived and will be with us until the end of March. Our thanks to those club members who have billeted these visiting coaches. Our thanks also to Jane Pulford who is currently working in Europe and loaned her car for the use of visiting coaches. This scheme is seen as having been very successful and we will be looking at continuing with it in 2015. MAPPING: OT has agreed to take on responsibility for mapping. During the year much focus was on mapping for the World Cup and Oceania with some updating of local maps. A priority now is to put some focus back on upgrading local Hobart maps used in autumn and spring twilight events. Wendy’s garage to be used jointly by Australopers and WROC. Australopers and WROC to pay Wendy an annual rental for use of the garage and parking of trailers. CLUB UNIFORM: We continue to be very visible through our club running tops – particularly at national and international events. CLUB WEBSITE: We continue to maintain a club website though this is an area that may need some additional effort in future to ensure it is always up to date. SOCIAL: Our thanks to Jane Calder for organising a number of social functions during the year. In addition the Wests did a great job of organising an event and quiz evening at the Risdon Pyramids which was well attended by representatives from all clubs. CLUB MEETINGS: Club meetings were held monthly at members’ homes and were well attended. As well as general business we continue to try to have a special presentation following each meeting. A highlight this year was Mike Calder’s photographic presentation following his and Jane’s visit to the Arctic mid year. 2014 AUSTRALOPERS OFFICE BEARERS: My thanks again to 2014 office bearers. I am stepping down as President after 3 very rewarding years in the position. While I enjoy being President I think it is healthy to have a periodic change in leadership and I certainly look forward to continuing to have an involvement in Club administration. Now that the World Cup and Oceania are over we can put all our efforts back into local events and increasing participation. The future looks good and I am confident 2015 will be another successful year for the club. I wish everyone in Australopers a great year. 2013 was a great year for Australopers. We had a break from organising any national carnival and were able to focus on local events and getting more newcomers involved. My thanks to the Executive, Committee members and all those members who volunteered to put on great events throughout the year. In many respects this report is similar to last year’s with a few notable additions. This shows how we are continuing to be an effective growing club in what many sporting clubs are finding difficult times. Increasing membership to 151 from 145. GENERAL: Australopers continues to be the largest Orienteering club in Tasmania and remains one of the dominant clubs in Australia. At the time of this AGM we have 151 members on the books, compared to 63 for EVOC and 54 for WROC. Australopers fourth in the club competition only 2 points behind equal second (29 to 31) with local club Melbourne Forest racers winning. Renny Duckett for his ongoing contribution as Treasurer despite his inability to compete due to injury. Rosie for her great contributions to each edition of O Know. Jan Hardy as our chief representative and Chair of the OT selection panel and more recently as Membership Officer. Mike Calder who has organised our event volunteer roster. Sue and Tony Mount who are always at events to help out newcomers. Sally Salier and Jim Laver for maintaining that equipment. Janet and Renny for their help at events and for providing their house for various Australopers functions. FINANCES: The financial report tabled separately will show we are financially sound and in fact have achieved a significant boost to our bank balance during the year. This was primarily due to our club running the now expanded schools and corporate challenge orienteering series, as well as the new winter street orienteering series plus bonus grants for the winter series and the Premiers award. MEMBERSHIP: Membership at today’s date is 151 up from 145 at the end of 2012 and 127 in 2011. (This includes some unfinancial members we are awaiting rejoining). These figures may be a bit imperfect but the new membership system will in future ensure more accurate statistics. 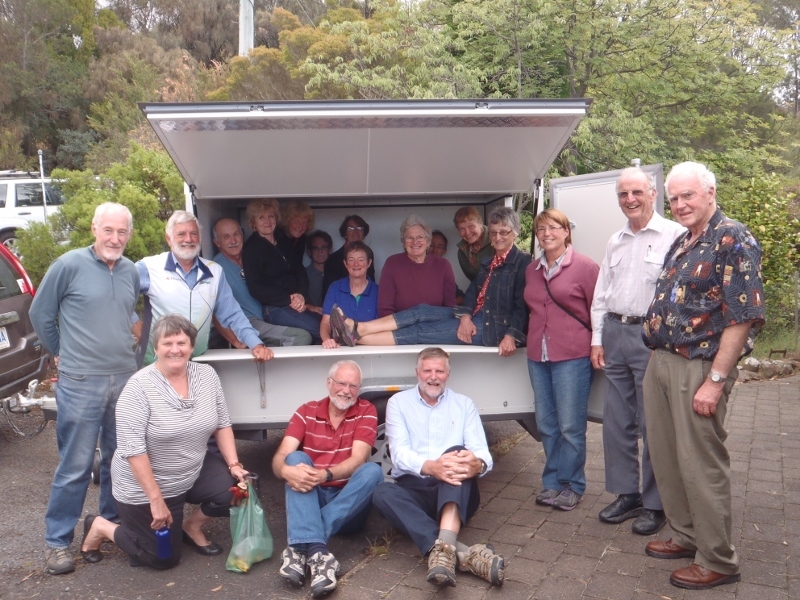 EVENTS: In 2013 Australopers organised a large number of events, both local and statewide. We have had considerable input to the 2013 calendar. In particular we continued to attract large fields at the Schools /Corporate Challenge series following a broad based publicity campaign and with the continued inclusion of a Primary School competition. Particular thanks to Martin Bicevskis and Mike Calder for their work with these series. The peak number of participants at any one Australopers event was 208 at the week 2 Corporate Challenge /Schools event in February. Australopers ran a successful Tasmanian Long Distance Orienteering Championships event on the Brookstead map at Royal George. COACHING: Coaching events were again held for both experienced and beginner members. MAPPING: It was a quiet year mapping wise, this also recognising a general shift in responsibility for mapping from clubs to OT. We benefited from utilising several new maps during the year in particular the new Battery Point / Salamanca Place map. EQUIPMENT: We put our new START and FINISH banners into use during the year and most importantly arranged for the construction of a new equipment trailer completed early in 2014. SOCIAL: In 2013 we held a number of social functions. CLUB MEETINGS: Club meetings were held monthly at members’ homes and were well attended. We continue to try to streamline the business component of meetings so that there is ample time for social interaction. 2013 AUSTRALOPERS OFFICE BEARERS: My thanks again to 2013 office bearers. 2014 will be a big year with Australopers members organising a large proportion of the year’s events. We are looking forward to two more successful Schools and Corporate Challenge series as well as the second Saturday afternoon series in the winter months. Who/what inspired you to start? Vili Bartholomew used to tell me how much fun it was whenever I met him at the university. He was a computer engineer and in those days THE university computer was on the ground floor of the Physics Department where I was a graduate student. It also seemed a good way to get out in the bush when I really couldn't afford the time to go on long bushwalks. What do you do when not orienteering ? Look after my three "boys" (2 dogs and an elderly husband) and two properties, grow as much as possible of our fruit and vegetables, bush walk, sing, play ukulele, keep somewhat abreast of what is happening with the sun and solar physics. What is ONE thing you like about orienteering ? That people of all ages can participate. A piece of advice for newcomers to the sport? "Practise makes perfect" except that in orienteering the perfect "run" almost never happens. I'm still hoping for one after almost 40 years! Highlight/lowlight of your O career? Highlight was probably 1985 when I accompanied the US Team to Australia. I trained with the team and went orienteering every day for about 2 weeks! Favourite/most unusual/most scenic place you have orienteered? Harriman State Park is probably my favourite area. Despite being less than 50 km from New York City this park has such great terrain that it was used for the 1993 World Champs. In the autumn it is very beautiful with all the lakes and the yellow-leafed trees. 2006 when I moved to WA. I grew up in Ballarat but amazingly, despite having a teacher who was into orienteering, I never really knew about it until I moved to Perth. I started rogaining first, when I was at Uni. Gary. It was a big part of his life in WA so I just joined in. Look after our young son Sean. Sew, try and grow vegies, travel. The chance to make friends of all ages, and then see interstate friends at national events. Don't run faster than you can navigate. Winning Australian titles for my age class. Lowlight - running off the map entirely! Peterdine - a lovely WA map - open rocky area, always sunny and warm. 45 Australopers members headed off to the mining and granite terrain near Bendigo for the Easter carnival. It was great to be able to gather beneath the Australopers Banner, to encourage, congratulate and commiserate with each other. Notable performances by Australopers were : 1st Family relay - Bert Elson, Grace and Matt Crane; 2nd M16A - Oisin Stronach; 3rd M60A - Bert Elson; 3rd M21AS - Matt Cohen; 2nd W21E - Grace Crane; 2nd W40A - Cathy McComb; 1st W50A - Christine Marshall; 2nd W10N - Zali McComb; 2nd M10N - Jett McComb; 1st W Junior B - Inala Day.